The CFA and TFA have differing versions of the story to offer. CHENNAI: Football in Chennai is now shrouded in darkness. Literally. A dispute between the Chennai Football Association (CFA) and its parent body, Tamil Nadu Football Association (TFA), saw the latter take the rather extreme step of cutting the former’s power supply. The move, which happened two months ago, has severely hampered the functioning of the CFA, which is responsible for the day-to-day administration of football in the district, as its officials now often start their day in the evening when there is some respite from the heat. The two associations have been sharing office space for decades, with both moving into the JN Stadium when it was constructed in the early nineties. The CFA — formerly the Madras Football Association — precedes the TFA by almost half a century. “Initially, we (CFA) were the ones who were allocated office space at the JN Stadium,” says CFA’s long-time secretary E Sugumaran. “We came to an arrangement with the TFA whereby they would pay us half the rent. Then at some point during the 90s, they insisted that the roles reverse as they were the parent body. We gave in and began paying them half the rent, which they would pass on to the SDAT.” This arrangement continued seamlessly till the late 2000s because, as many CFA officials admit, there was little difference between the two associations. At one point, the TFA was run mostly by officials from Chennai. CFA officials claim that despite the development, they still continue to pass on half the rent to the TFA every month. Lying around among the many unattended files at the CFA office is a letter specifying that their share of the rent from January to June 2018 had been passed on to the TFA along with the copy of a cheque for `35,000. Sugumaran still hopes that the situation can be resolved amicably. “Just like they have access to the switch to cut off our power, we have access to the switch to cut off their power,” he says. “But we see no point in acting like kids. 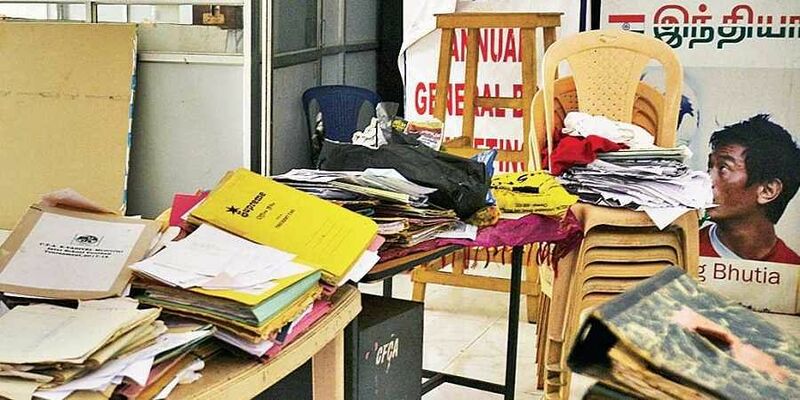 The two associations — Chennai Football Association and Tamil Nadu Football Association —have been sharing office space for decades, with both moving into the JN Stadium when it was constructed in the early nineties. The CFA — formerly the Madras Football Association — precedes the TFA by almost half a century.